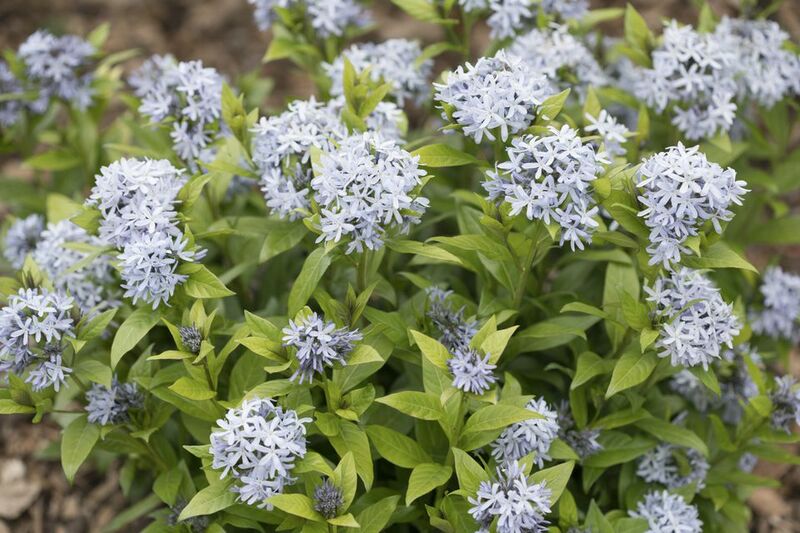 The plant species Amsonia was given the common name "Blue Star" for its soft blue, star-shaped flowers. The individual flowers are small, but they bloom in fluffy clusters and put on a lovely show for several weeks. Blue Star flowers are one of the truest blues you will find in flower colors. The plants are native to many regions of North America and grow pretty much problem free. The airy but substantial texture of the foliage provides a great foil for almost any other plant, making them very versatile in garden design. A bonus is the brilliant yellow fall color of their foliage. Leaves are 3 to 4 inches, narrow and lance-shaped with a pronounced mid-rib. Hardiness will vary with species. Most are perennial to at least USDA Hardiness Zones 5 to 11. Amsonia tabernaemontana can be hardy down to USDA Zone 3. You will get more flowers if you plant your Blue Star in full sun, but the plants can handle partial shade and may even grow better there in hot, dry climates. Most Blue Star varieties will grow about 2 to 3 feet tall and 2 to 3 feet wide, but size will depend on the variety you are growing and the growing conditions. They tend to be small, tidy, shrub-like clumps. The plants bloom sometime in either late spring or early summer. The flowers are followed by interesting seed pods. Amsonia plants like a neutral soil pH, between 6.2 and 7.0, but will grow just about anywhere, even in poor soil. They do not like prolonged dry conditions but once established, Blue Star plants can handle brief periods of drought. Blue Star can be grown from seeds harvested when the pods dry. You can start seeds in the fall and over-winter them in a cold frame or protected area, then transplant in the spring. Simply cover them lightly with soil and keep the soil moist, until the plants germinate. If you don't want to start seeds, Blue Star plants are becoming more commonly available in garden centers and develop into good sized plants within 2 to 3 years. The soft, billowy foliage of Blue Star allows it to fit in almost anywhere. It pairs especially well with larger leaved plants, like peonies and hosta. A classic favorite combination is Blue Star paired with the seed heads of oat grass. The bright yellow fall foliage is stunning next to tall sedum or purple coneflowers. Arkansas Amsonia, Hubricht's Blue Star, Narrow Leaf Blue Star (Amsonia hubrichtii) - Narrow, needle-like leaves and bright blue flowers. Ozark Bluestar (Amsonia illustris) - Taller plant (4 feet) with glossy leaves and larger flowers. Blue Dogbane, Eastern Bluestar, Willow Amsonia, Woodland Blue Star (Amsonia tabernaemontana) - Wider leaves and pale blue flowers. Blue Star requires very little maintenance. They can get floppy when they are heavy with flowers and when the seed pods form. To prevent this, you can either stake them with a hoop or trim them back by one third, after flowering. Trimming will mean losing the attractive seed pods. Since deadheading is not necessary, framing your Blue Star with sturdy plants on either side is a third choice for helping to support the plants and keep them upright, while allowing the seed pods to remain on the plant. Blue Star plants will bush out and get fairly wide, up to a couple of feet across, but they do not spread or travel very far or become a nuisance. You can divide the plants if you want to make more plants, but it is rarely necessary. Blue Star plants are virtually problem free. No pests or diseases regularly bother them.